Have you ever opened up Google Maps, picked an unknown location 1,200 miles away by car, and driven the entire way there the next day? That’s what my partner Jamie Walter and I did for Great American Eclipse. We came home with an experience of a lifetime and an unforgettable story of adventure to tell. Jamie and I are both professional photographers. We began planning for the 2017 eclipse that would make its way across the entire United States almost a year in advance. In our first iterations of planning we dreamt up grandiose and elaborate scenes of scaling the Sawtooth Mountains in Idaho to watch and photograph it. However, we quickly realized we just didn’t have the resources to execute such a plan. Instead we decided on a road trip somewhere in the Southeast corridor of the country: Illinois, Tennessee or Kentucky. We refined our goal into one simple objective: capture an image of the eclipse during the moment of totality, when the Moon completely covers the sun and turns the day to night. After a few beers Friday, August 18th, we pulled up Google Maps and zoomed in on the path of totality. The 70 mile wide path where the moon would completely cover the sun stretched from Oregon to South Carolina. Just 30 miles east of Carbondale, Illinois, we stumbled across Shawnee National Forest in the Southernmost part of Illinois. With all the hype about gridlocked traffic and hotels booked out a year in advance, camping was somehow still available there! Our destination was settled. We just hoped it wasn’t too good to be true. With an 8 a.m. start the next morning we headed West on I-90 through New York, Pennsylvania, and Ohio. Then we drove South through Kentucky and Indiana, arriving finally at Shawnee National Forest well past 3 a.m.
We arrived to a full parking lot but miraculously found a spot, moved the seats back, and closed our eyes. We managed a restless two hours of sleep before I accidentally set the car alarm off at 5 a.m. The familiar sound of a blaring horn and sunrise peeking through the trees woke us up just enough to get up. Hiking around the Garden of the Gods cliffs made it clear to us we would face jam-packed crowds on a large cliff face with several cameras on tripods — not an ideal (or safe) place to be. So we moved, eyeing another campground further west. In the already 100 degree heat, we set out driving past endless farmland and found ourselves a charming little country store. With just a few hours of sleep on us, we couldn’t resist the possibility of hot coffee and a southern style homemade breakfast. After fueling up on biscuit breakfast sandwiches and getting to know the locals, Jamie and I headed across the forest to our new destination. The campground seemed like a old farmland, with 30 ft by 60ft rectangles for campsites either plowed or chopped out of thick and rather useless vegetation. It was so hot we both started sweating profusely immediately after exiting our car. We set our tent up and jumped back into the running car with the A/C on full blast, deciding to celebrate our new 24 hour home with a much deserved nap. After our nap we found a local climbing area and climbed a few pitches. It felt good to be outside moving our legs and relaxing our minds before the big day. A delicious meal of chicken sausages and spanish rice filled us up and sent us into a deep sleep after a two days of nonstop action. We waited right up until the weekend of the eclipse to plan our final destination largely because of weather. Having decided to drive, the last thing we wanted to do was travel 1,000 miles into a cloudy day. We were optimistic about the cloud cover, though there was still plenty of time for the forecast to change. Jamie even messaged his friend, the weatherman for Maine’s biggest TV news station, for his expert opinion. The verdict: while more promising to the East, we were unsettlingly close to a large system coming in from the Midwest. We were either going to have a perfect day, or it would be very cloudy. We woke up early on August 21st, eclipse day, to clear skies. I anxiously organized, cleaned, and reorganized my camera gear. I set my tripods up early and made breakfast for the both of us. We sat in our camp chairs in the shade, hiding from the sun as long as we could. It felt like any other normal day. Birds chirped, the constant hiss of locusts drummed on, and the sun still rose in the East. On our drive down, Jamie had took notes on when the eclipse would start (in our location,) at what angle in the sky it would be (high), and for how long it would last. At 11:53 am, the moon would begin to move in front of the sun. 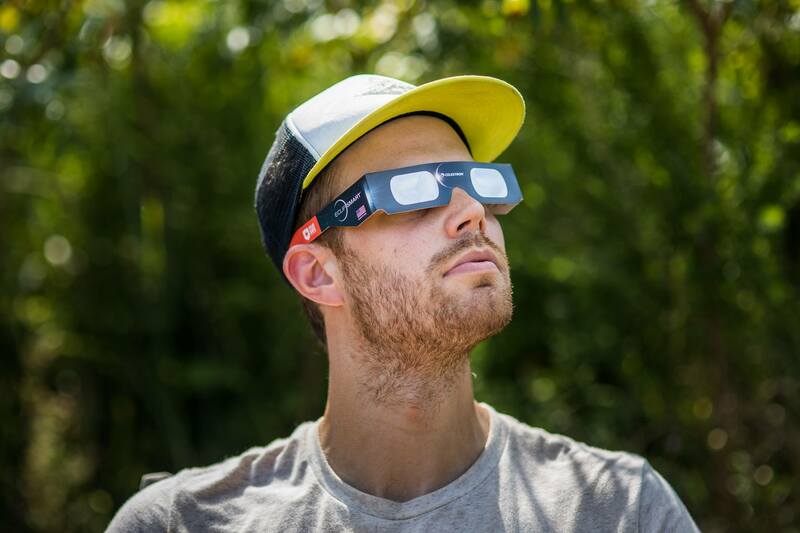 And so, at 11:53 am we put our solar filters on over our lenses and pointed them to the sky. It was 100 degrees and bright daylight. My shirt was soaked to the skin. But, through our lenses, we saw a black sliver in the sun. It was happening. We shot obsessively as the eclipse grew in size over the next hour. Clouds began to build behind us, sometimes completely obstructing our view. When clouds passed partially in front of the sun, it made for some amazing images. Our tensions grew as the moment of totality drew near. We could only hope we would actually get a chance to see it. An interesting thing happens as the moon moves across the sun: it gets colder. 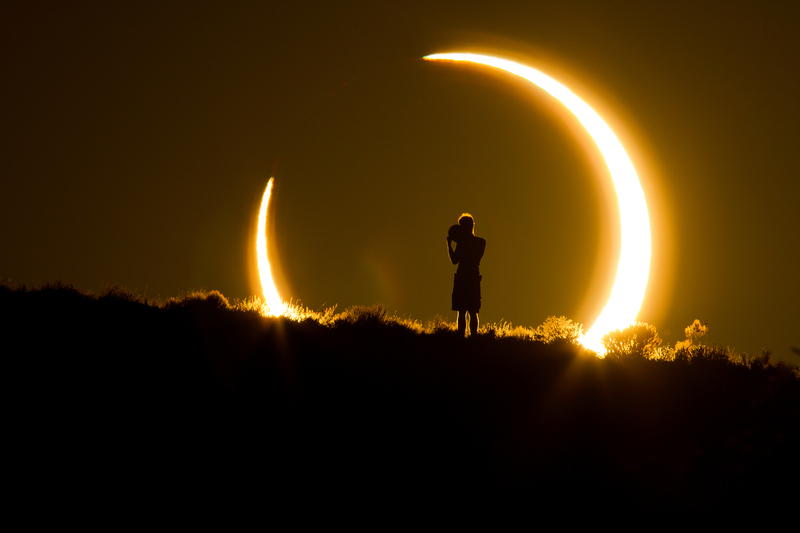 In some cases a 20 degree change between the start of the eclipse and totality can be observed. As we drew nearer to totality, it got noticeably cooler. We stopped sweating and a cool breeze forming at our backs felt refreshing. And with our luck, the cool air in the sky completely destabilized the clouds building above us. Just 10 minutes before totality, almost every cloud in the sky had disappeared. We were going to see a total solar eclipse. At 1:21 pm our alarm went off, reminding us we had just two minutes before totality. 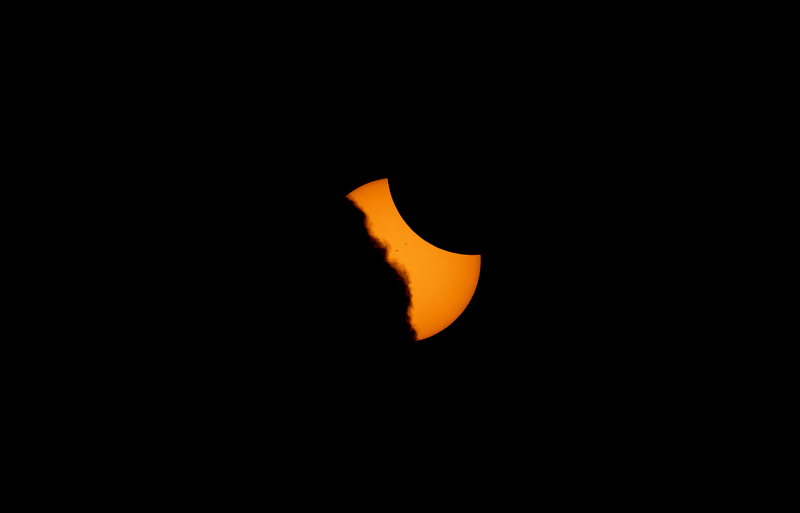 At 1:23 pm, the moon moved completely in front of the sun. The sky went blue and we saw stars and planets at midday. All around us we heard cheers of elation, of pure astonishment and genuine happiness. We let out our own shouts of joy as we tried to balance the near impossible task of both getting the shot we dreamed of, and sitting back and being present with the once in a lifetime moment we were witnessing. We made our drive back home straight through the night in a 23 hour epic, stopping only to switch drivers. A few hours into our drive we were already dreaming up big plans for the next eclipse coming 2019 in Chile and then of course the 2024 eclipse in my home state of Maine! 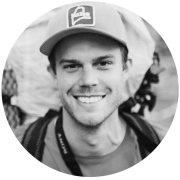 Adventure, documentary, lifestyle photographer. Mountaineer & endurance athlete. Maine-bred and Boston-based.